It's every male wallflower's dream: walk into a hall of beautiful people, choose the woman you would like as a partner, nod confidently in her direction, and watch as she meets you on the dance floor. One caveat: In this country, when you take her hand you had better know how to tango. With the goal of understanding my fascination with the dance and maybe learning a few steps, I introduce myself to Edith Paez, a tango instructor in Buenos Aires. "It's OK to be a beginner in an all-level class?" I ask. "Good, because this is my first tango lesson." "Suerte!" Paez quips, exhibiting some Argentine pluck. Good luck. My obsession with the dance began in Paris where, weather permitting, a tango group meets a few times a week in an amphitheater on the banks of the Seine. The music caught me first: somehow light, sultry, and full of longing, with the accordion-like bandoneón grabbing my heartstrings as I rode by on my bicycle. I watched, entranced, trying to understand it all, but it seemed beyond me - everyone was doing different steps, forcing me to watch one couple at a time, and even then, I couldn't figure it out. No matter. Simply watching and listening was a beautiful way to spend an evening. In Buenos Aires, tango fanatic and area native Silvia Guzmán agrees to be my guide and immediately puts a finger on what fascinates me most about the dance. "It's three minutes of connection," she says as we watch dancers go 'round in counterclockwise circles at the Salon Canning "milonga," or tango hall. "You're always right in front of your partner, never next to each other." The sensuality is delicious. We watch instructors call out a few steps - "uno, dos, tres" "apart, together, apart" - as his feet scissor in and out between hers, which flare in circles. When the class ends and the floor fills, people aren't just connecting, they're smoldering. I zero in on one couple and while their feet flit about, cat-and-mouse style, their heads touch, and their chests are pressed together. I might as well be staring through a bedroom window. Nothing this exciting will be happening for me anytime soon. Guzmán steers me toward websites and tango magazines that list courses happening at almost any given hour around town. There are so many that it's like looking up movie listings in the States: Starting around noon, pick the time you want to go and there's a class or three happening, broken down by skill level. Guzmán and many other people also counsel the following: Once you find a place you like for lessons, stick with it. Luck and word of mouth had led me to the tango school run by Paez in the very hip Torquato Tasso Cultural Center in the San Telmo neighborhood. The benefit here is that Paez, a former master ballerina, both teaches and recruits a set of very capable instructors. "In the past five or six years, tango has become our national hallmark. It's like a cultural renaissance," she says. "People wanted to connect again. It was a return to the city's cultural roots." Like anything else that has been around more than 100 years, tango's popularity has waxed and waned, but the French capital played a key role in cementing the dance as the Argentine capital's calling card. Though the dance's humble beginnings were in 1880s Buenos Aires (often in bordellos), Paris being Paris, the City of Light transformed it from something vaguely sleazy into a global phenomenon in the early 1900s. At my first lesson, Paez teaches our group to walk again. About 10 of us stride in a circle as she guides us - "uno, dos . . . uno, dos, tres," she says as we step in a matching short, short, fast, fast, fast cadence. There's no smoldering; we're not even holding partners, but it's curiously gratifying just to put one foot in front of the other. When Paez pairs us with other dancers, I am matched with a well-dressed, gracious 60-year-old Argentine, and for the first official tango step of my life, I stomp on her stilettos. I go to the next course with my girlfriend and, out of politesse, I make it to our second step before I tread on her toes. A travel writer, she refers to me as a "lumbering Frankenstein" on her blog - a link I conveniently forget to send to family and friends. During the course, however, we learn a similar uno, dos, tres step, this time with a crossover that actually feels like tango. I crush her toes and squeeze the blood from her fingers, but once in a while we get it right. No one would be impressed, but to simply do a few steps correctly with each other is exhilarating. For course number three, I sit in on a class given by Dante Sánchez, 20, the 2007 salon-style world champion (tango is broken into several styles). He practically gives his time away, charging 13 pesos an hour for group lessons - the rough equivalent of getting passing lessons from Tom Brady at four bucks a pop. I ask Sánchez what the connection means to him and it's simple: "the music, the woman, and the floor." "The floor?" I say, thinking my Spanish is failing me. He responds by doing a stiff, hokey jig where he hops around on the floor like a marionette, before switching to tango steps and sliding his feet as if in a trance. "You glide over it - it's beautiful." "Like ice skating?" I venture. "In my parents' house and at fiestas, we listened to the music as kids," Sánchez says. "When I hear it, I think of when I would listen with my father. When you listen, there's an emotion that runs through you. It's hard to explain, but it's like being in love." Quang Bobrowski, also a former professional ballet dancer, is visiting from Germany for a few weeks of tango immersion at Paez's school, sometimes taking a couple of classes a day, then going to milongas at night. It's easy to see his progress. At one point, something clicks and he gets so excited, he breaks rank and does a ballet-style split jump. "Taking the class, something has changed," Bobrowski says, catching his breath. "I could feel another muscle working. Suddenly, you feel another part of your leg that gives you a power to lead." "You can dance with less tension," he says. "It's like dancing heart to heart." A few nights later, I meet Guzmán under a giant outdoor gazebo in the tourist-free Belgrano neighborhood at the beautiful Glorieta de Barrancas de Belgrano milonga. Here, a few nights a week, tango courses are followed by open dancing, and Guzmán has promised to explain her connection and get me out on the floor. Porteños (Buenos Aires natives) of almost every age and walk of life are here to dance. There are 70-year-olds in their Sunday best and a twentysomething couple of a dressed-to-kill woman in purple pumps and a guy in a track suit and black sneakers, all creating a near-perfect cross-section of the city. The big, glitzy tango shows downtown make for great spectacle, but here under the gazebo it feels like staring into the heart of the city and its inhabitants. "It's a wonderful dance to learn about the relationship between a man and a woman," says Guzmán. "Having a man hold you is like a lesson in letting life take you somewhere and not trying to control it all the time." "Dancing is a place where people are alone, then they meet someone, they're held," she says. "It's very sensual. It's like a drug." At this point, her attention floats away into the crowd in front of us, or perhaps she's daydreaming of some tango connection in the past. "There's passion," she says, floating back. "It is passion." Suddenly, she grabs my hand and commands, "Put down the pen!" pulling me onto the floor so I can, um, strut my stuff. I show her the uno, dos . . . uno, dos, tres and the crossover step I've learned, along with one that sympathetic locals have taught me. "That's it?" she cries, giving my limited repertoire a good-hearted tease. I turn three shades of red, but she graciously sticks it out with me, as people literally dance circles around us. When she catches me regressing into "lumbering Frankenstein" mode, she squeezes my hand and says, "Follow me," breaking into a bit of a wild freestyle. It's probably tango heresy, but it's perfect. Later, I join Guzmán and some friends for a drink at a crowded sidewalk cafe, but in my head, I'm still under the gazebo with the sun going down, watching people dance, hearts pressed against hearts. Joe Ray is a Paris-based food and travel writer and photographer. He can be reached through his website, joe-ray.com. Dedicating yourself to lessons and milongas for a week will help you get out on the floor with confidence, but even a couple of classes can be fun. Group courses run an hour to 90 minutes for about $4. 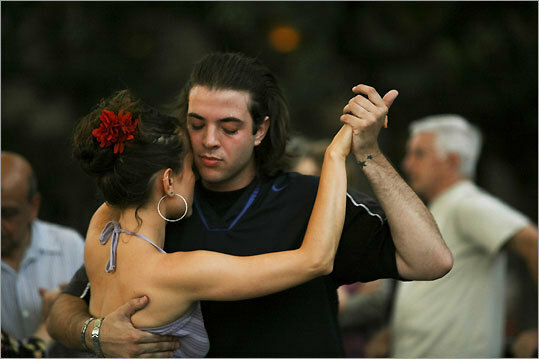 Dante Sánchez was a 2007 world tango champion and gives group lessons at Paez's school. He also gives private lessons for about $33 an hour. If there are language concerns, his brother sits in on lessons to translate. An easy-to-find tango reference with course listings and (limited) content in English. Even if you have never danced in your life, come to the dance halls known as milongas, have a drink, and get to know tango and its intricate customs. Lessons start at around 9 or 10 p.m. and open dancing begins as late as 11 or midnight. Ring buzzer number 5, then follow the music up one floor. Minimal cover charge. Tango fanatic Silvia Guzmán's favorite. A funky, underground milonga in the Almagro neighborhood. Best on Tuesday nights. Located in a park in the beautiful, residential Belgrano neighborhood. Lessons and dancing in the warmer months on two or three weekend nights. A classic and a great starting point to get the fever. Sparse in detail, you are here to dance (or at least watch). A stone's throw from where Edith Paez runs her school. Rooms $121-$190, breakfast included. A low-key option in the funky Palermo neighborhood in a tango-centric, 10-room B&B. Doubles $58-$85 with breakfast, a kitchen, and free tango lessons. A Buenos Aires landmark in the Belgrano neighborhood. About $20-$30. Closed Sunday. Though Argentina has an enormous coastline, seafood is a curious rarity. Oviedo is one of the few exceptions and one of the city's best restaurants and wine cellars. $60-$100 plus wine. Argentines do Italian right and this family-owned restaurant is one of the best in town. Located in a sketchy neighborhood (take a cab). About $20-$30. Closed Sunday night and Monday.